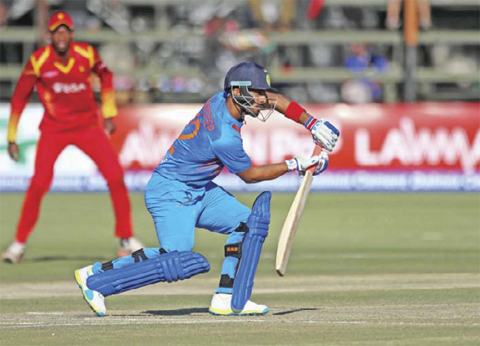 HARARE: Mandeep Singh blasted a quickfire unbeaten half-century as India crushed Zimbabwe by 10 wickets to level the Twenty20 series yesterday. The result sets up a series decider in the third and final game that will also be played at the Harare Sports Club tomorrow. Zimbabwe won the toss and elected to bat, but could only muster 99 for nine in their 20 overs as the Indian bowlers strangled the run-rate. The tourists made short work of their reply, racing to their victory target off 13.1 overs as Mandeep Singh (52 from 40 balls) and fellow opener Lokesh Rahul (47 from 40 balls) put on a century stand.